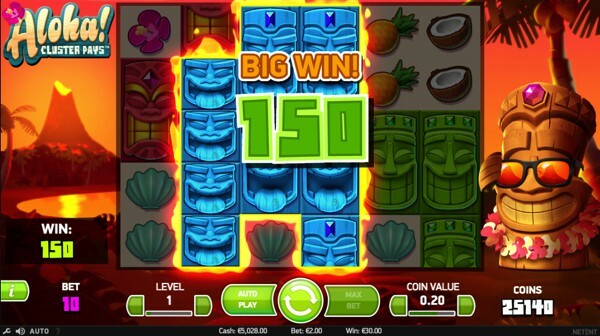 Aloha means compassion, peace, and affection and you will find all three in this well-designed slot game from Net Entertainment, presented on 6 reels, spread across 5 rows and featuring no standard pay line structure. As the title suggests, wins are formed by displaying clusters or groups of nine or more symbols joined vertically or horizontally together. The bonus features include wild symbols, free spins and sticky win re-spins with a top paying jackpot of 10,000 coins up for grabs. The background is a beach view of Hawaii with an active volcano located in the distance on the left-hand side of the screen. There’s also an animated Tiki statue located on the right-hand side of the reels surrounded by palm trees and beautiful flowers. There is a total of seven themed symbols presented on the reels and include a red Tiki mask, a green Tiki mask, and a blue Tiki mask. You will also discover a beautiful flower, a shell, half a coconut and a delicious pineapple on the reels. Aloha Cluster Pays has a fantastic range of betting options to cater to beginners and experts alike. The line bet is displayed in the form of different levels. The lowest level you can bet is $0.10 and reaching a high of $1.00 on level 10. The coin values can also be altered with the minimum starting at $0.01 and increasing to a maximum of $0.20. If you select level 10 with a coin value of $0.20, you will bet the highest value of $20.00 in the game. The brown box with a big white question mark represents the wild symbol and will stand in for the highest potential symbol but will not replace the free spin scatter symbol. The travel sticker with the words free spins written across it acts as the scatter symbol and will also unlock the main feature in the game. The free spin feature in Aloha Cluster Pays is activated when you display three or more free spin scatter symbols anywhere on the reels. The more free spin scatter symbols you display, the more free spins you can earn. Six Free Spin Scatter symbols will award you with 12 free spins. During the free spin feature, lower valued symbols such as flowers and fruit will gradually fall away so only high valued symbols remain towards the end of the free spin feature. If your last free spin does not result in a winning combination, it will continue spinning the reels until it creates a win. The free spin feature can also be re-triggered by displaying more Free Spin Scatter symbols during the feature. This feature is randomly activated after any winning combination, and you will notice the symbols involved in the winning combination will be frozen in place for a free re-spin. Any new symbols adding to the cluster will activate another re-spin, and this continues until there are no more matching icons. Aloha Cluster Pays provides a low to medium volatility, meaning you will receive small but frequent payouts the longer you play. The game is designed to let you mind escape to a holiday destination and with the high-quality graphics and exceptional sound effects, it’s a dream come true, especially when the free spin feature is triggered. You can try Aloha Cluster Pays below for free. We have embedded a demo version of the game. If you want to play with real money, then you can find the game at casinos that offer games from Net Entertainment.